Per request by my friend Hannah, I’d like to share my two favorite recipes for mayonnaise. The first is my classic plain version, perfect for sandwiches, wraps, or lettuce wraps. I’ve also fallen in love with Avocado Mayo, which is suited perfectly for sandwiches/wraps as well, but also makes a great dip for veggies and chicken tenders (homemade of course)! So I’ll get right to it. Now, if you’ve ever tried to make your own mayo before, you’ve probably had to decide how you were going to make it — in the blender, with a mixer, or by hand. Well I’ve tried them all. For me, the best tasting and best consistency mayo has come from using my stand mixer. You can also use a hand mixer if that’s all you have, but the stand mixer helps prevent sore arms. ;) Some of the problems that occurred for me using the other methods (which are often recommended in cookbooks) were separated mayo and super stiff mayo that you wouldn’t want to spread on anything. So if you’re new to this, I recommend starting off with the mixer method and then if you want to try it in the blender or by hand, go for it! I know some people definitely find success with those as well. 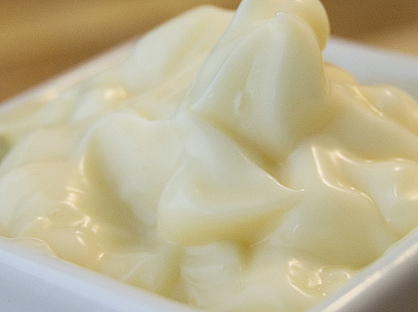 Here is my recipe for plain mayonnaise along with detailed steps to prepare. A note — I use mostly grapeseed oil, as it is flavorless. And I usually add in 1-2 Tbsp of extra virgin olive oil for a tad bit of flavor. However, you can TOTALLY omit the olive oil if you want to. I know some people really don’t like the taste the mayo has when olive oil is added, because it is such a pungent oil. And for that reason, I don’t make my mayo with solely olive oil, which is why Hannah wrote in asking for this recipe. Her recipe called only for olive oil, which made for quite the mayonnaise, if you can imagine. So the grapeseed oil is key here for its neutral taste! 1.) Into your room temperature mixer bowl, add the eggs, sea salt, lemon juice, vinegar, pepper and mustard. Using the whip attachment, beat on Medium-High speed until mixture turns light in color, about 3 minutes. 2.) Add the grapeseed oil *a drop at a time* until you have incorporated about half. Adding a drop at a time is KEY for proper emulsification. BE PATIENT, it will be worth it! You can then add the rest of the grapeseed oil and olive oil in a *slow* stream, keeping an eye on the mixture to see that it’s incorporating at the same rate you are adding the oil. You can use a measuring cup or ladle to add the oil, but I actually prefer to use a squeeze bottle. I had a little one left over from something, and had the idea to use it for the oil to ensure I was only adding a drop at a time. Works perfectly with no room for error! And on to my yummmmy favorite, Avocado Mayo! 1.) In a food processor, puree the avocado with lime juice and optional Tabasco and garlic clove. 2.) Add in your mayonnaise and blend until well combined. Enjoy! You’ll love! Thanks, Hannah, for having me whip up these mayos! I’m now going to make some Healing Cuisine Chicken Salad with the Avocado Mayo and eat in a lettuce wrap. YUM. if you add whey, it becomes much healthier for you, AND keeps for up to 6 weeks in the fridge. Add 1 tsp whey to the eggs mixture, before you add the oil. If you use a stick blender (immersion blender), you don’t have to worry about putting the oil in slowly – it emulsifies really easily and quickly. I’ve found a drop or three of stevia liquid adds just that bit of sweetness that store mayo has. After you’ve made the mayo, let it sit out at room temp for a few hours to let the whey do its magic. Don’t worry, it WON’T spoil. Just make sure you’ve used eggs from pastured chickens. Here’s the link to one of the recipes I’ve used (I’ve been successful with sesame oil, btw). I too find the olive oil too flavorful. Mmmm, I am going to try avocado mayo soon. Interestingly, whilst living in Spain I never had any problems making mayo. I just realized that it´s probably because we had fresh olive oil and farm fresh eggs on hand! I have never made mayo. Your recipe sounds like the best with the grapeseed oil. I think it would be easier for me to make it using a stick blender. What brand do you recommend? I would like to try your buttermilk ranch dressing. Also, I would like to have a recipe for blue cheese (roquefort) dressing. Making it with homemade mayo would be delish! Thanks. I don’t have a blue cheese dressing on the site mainly because we don’t eat blue cheese. You want to limit your intake of molds as much as possible because it is hard to get mold to leave your cells once it is internalized. That goes for both inhaling it and consuming it.